Responsive websites are designed for optimum viewing on different devices. They are just as easy to navigate on a smartphone or other device as they are on a desktop. As you can see this is not friendly at all for the potential customer. This type of website will be quickly left. 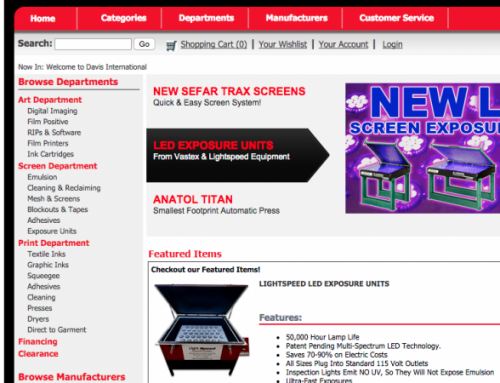 Below is a responsive example found at KriXis Consulting’s responsive website design page. The difference is night and day. Before you continue reading I encourage you to look at your own website on your phone or tablet. 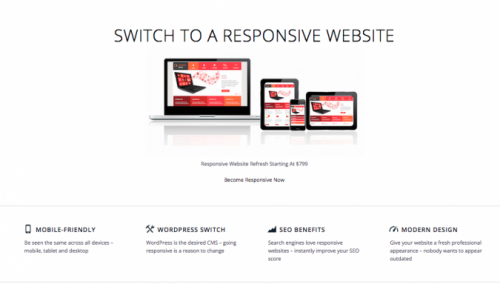 You will immediately see if you have a responsive website or not. This post highlights the top 15 reasons your website should be responsive. After reading, the decision to make the change to responsive website design should be easy. If a customer is on your website via mobile the last thing you want is for them to leave immediately because the screen is impossible to read. Maybe they were just on your website at the office, but had a doctor appointment. While in the waiting room they wanted to learn more about your services. However, your website is impossible to navigate from their phone. 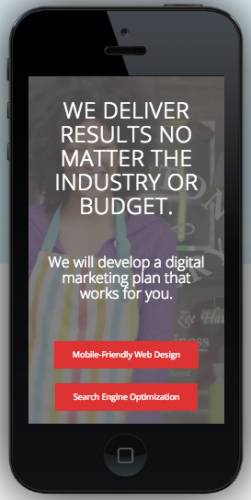 That lead leaves your website and finds a company with similar services that is mobile-friendly. Creating a responsive website ensures that the user-experience is the same on all devices. It is not uncommon for web developers to create multiple versions of your website. For example, your website may be http://xyz.com; but a http://mobile.xyz.com may have been created separately. This practice helped make non-responsive websites mobile-friendly, or at least appear to be. The downfall arises with the maintenance and upkeep of two different websites, not even thinking about the possibility of new devices for searching the web being created in the future. Google likes responsive website design. Why would you want to go against the company that controls where you appear? Google not only recommends responsive website design as the best way to target mobile and tablet users, it also favors mobile-optimized sites when presenting results for searches made on a mobile device. Yahoo and Bing state the same. This should be reason enough to make the change. More and more people are getting away from accessing the Internet through a desktop. Google searches done on mobile devices have actually been surpassed by searches done via desktop. This trend is not going to change, and the gap between mobile v. desktop will continue to expand as more people utilize their smart phones to their capacity. In fact, 61% of people have a better opinion of a brand based on their mobile website. 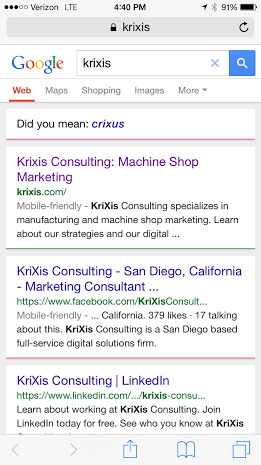 Are you ready to make a responsive website with KriXis Consulting? We all know that shopping online is easier than driving to the store. In many cases it is cheaper as well. Studies show that out of those who shop online 80% have bought something through their mobile device. A responsive website design gets your business a piece of that large influx in sales. 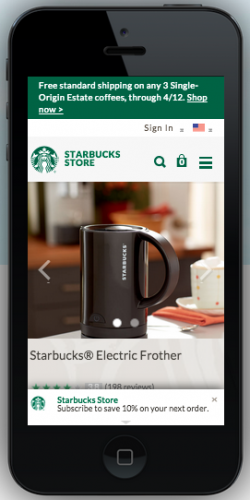 Every leading business is developing a way to easily make purchases on mobile devices. They are developing responsive website design to make these transactions as simple as possible. As a business owner you should pick up on this trend since it works. This is an opportunity to get ahead of your competition, or a chance for your competition to get ahead of you. If you are reading this I am sure that you have heard of CMS’s (content management systems) such as WordPress. These CMS now have theme options that allow for a responsive website design. Going responsive also provides the perfect opportunity and reason for you to change over to one of these CMS. They make your online life much easier, we suggest going with WordPress and I’m sure most would agree. Responsive websites may cost more to initially have designed and built. However, this investment requires less maintenance cost in the long run, since the responsive website will automatically adapt to every device. Making them considered one of the most cost effective and time saving development options available today. Our price is set to get you started towards a responsive design today. As stated before many businesses have different websites for different devices. Search engines such as Google prefer using just one URL, hence providing an SEO boost. Also, Google uses a separate algorithm for mobile devices; this algorithm marks some websites as mobile-friendly. A responsive website design will make your website mobile-friendly. Notice the gray ‘mobile-friendly’ tags in the image below. Pay-Per-Click advertising can benefit your business by allowing you to specifically target a customer based on location and search terms. Google Adwords has the feature ‘enhanced campaigns’, which now allows you to target customers by device. Having a responsive website design adds to the flexibility and specificity of your paid marketing campaigns. Bounce rate refers to people heading to your website and leaving before checking out other pages. You want to have a lower bounce rate. As more people visit websites on their phones, they will expect to be visiting an operable website. If your website looks awful on mobile, customers will leave. Responsive website design guarantees the same functionality as they would have on a desktop. 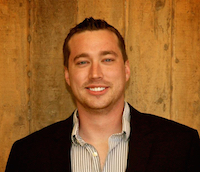 As a business owner you should have Google Analytics attached to your website. Google Analytics allows you to track where traffic to your website is coming from and what pages people are landing on when they do arrive. Most inbound marketing strategies include social media and blogging. ComScore has recently completed a study that shows 55% of social media usage is mobile. As you change to responsive website design you would be able to see in Google Analytics that customers being funneled to your website from social media are staying longer. Our approach towards digital marketing begins with a responsive foundation, but then attached all the tools needed to collect and record data. The original iPhone was released in June 2007. The iPad was released in September 2010. These devices completely changed the way people use and connect to the Internet. New devices will emerge, and a responsive website design will adapt to that device. 75% of Americans are using their phones while in the bathroom. They are taking this time to catch up with social media or look for things online. Responsive website design will give customers a positive web experience during this time. Everyone has been to websites that are impressive. People have also gone to websites that appear old, cluttered and lousy. How do you want your business to appear? Our small business digital marketing page is a sleek, clean and up-to-date look, which was built with responsive website design. There are a few factors you need to consider after deciding to go with a responsive website design. Price – you need to know your budget, you can find very cheap work, but you do get what you pay for especially with marketing services. Timeframe – knowing how quickly you want to make the change is essential for any developer, our turnaround time is less than one week. Complete Redesign – making the change to responsive website design is a great choice, however, going with the same layout as you had previously may not work, you should be open to change. Long-Term Planning – many marketing firms like to work with a foundation they started, when choosing a website designer you should inquire about other services they offer. The reasons above should motivate you towards responsive website design. Adjusting to what your customers are doing is necessary for all businesses to succeed. Thank you for taking the time to read this post, we greatly appreciate all social media sharing, as well as sharing this information directly with friends and colleagues. You can click here to learn more on how KriXis Consulting can begin the responsive website design process with your business.